Summer time has arrived. Time to get your body in shape for your bikini and time to get your hair in shape too! Fantastic Sams will not only cut your hair, they have products to keep your hair looking beautiful all year long. I can't remember the last time I visited my neighborhood Fantastic Sams so I went in for a haircut recently. I was immediately greeted warmly by the stylists and I love the atmosphere of their salon. I've been in a few discount hair salons and Fantastic Sams is definitely a cut above the rest. Their waiting area has very comfortable chairs and even a child's play area with table, chairs, and toys to keep kiddos busy while mom gets some attention. Everything is also very clean and organized. When my name was called, I was pleasantly surprised to get my hair washed and conditioned as part of my haircut. Many places just squirt your hair with water before cutting it, but Fantastic Sams takes that extra step to pamper their customers. I was looking for just a trim since I'm trying to grow all my hair out to one length and the stylist was simply wonderful. She didn't rush through my haircut and she chatted with me sincerely the entire time. She even blow-dried my hair and straightened it for me. I have lots of thick hair so it took her a while, but I could tell she was truly enjoying her job. It was a fabulous experience and I'm thrilled with my haircut. 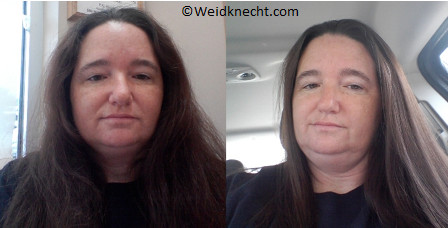 (You can see my before and after photos below. I'm not so good at taking "selfie" photos so I apologize for the quality but I wanted to show you the difference.) I've also been using their Fantastic Shampoo and Conditioner and I really love it. It foams up nice and thick, rinses clean, and leaves my hair soft. I will definitely be visiting them again! One lucky reader will win a bottle of Fantastic Shampoo and Conditioner, plus a free haircut at Fantastic Sams! To enter, just fill out the Rafflecopter form below. You must be at least 18 years old and reside in the USA. Giveaway ends at midnight ET on 7/1/2013. Good luck! i like the fact that they have treatments for damaged hair. i sure could use it. I like that it is so easy to find a salon in your area. I like that they have a men's line of products. I learned that they do facial waxing, I didn't know that. They do just about any hair service you would want. Reduces frizzy and fly-away hair. Instantly penetrates to add moisture, shine and conditioning. Helps to dry hair more quickly. I learned they offer a deep conditioning treatment. I learned that they also offer coloring services. I like their prices and that they often have coupons in my ValPak mailers! I like the Nourishing Serum with Argan Oil. I began going to Fantastic Sams when I was just a small child. It's so nice to have them in Georgia now. I'm glad to learn about their services for damaged hair. I like that their stylists areare always up-to-date on the latest styles and trends. I also really love their leave in conditioner. I have 6 localtions within 10 miles of me. I would like to try their Nourishing Serum with Argan Oil! I learned that there's a Fantastic Sams about 9 miles from me! I like that there is no appointment needed. I learned that they have a whole line of hair care items for men! I learned that their volumizing regimen is formulated with honey for increased moisture and shine. I learned that they have coupons. I learned they have over 1200 salons! I like that they have a salon locator on the website. I like that they have a line of hair care for men too! Use it once a week to remove chlorine, brighten highlighted, bleached or grey hair. Excellent for removing styling product build-up and mineral deposits caused by hard water. Thanks for the giveaway…they have over 1200 salons. I like that they have a salon finder! I learned they do foil highlighting, thanks!